There is something about shaving soaps worth noting – what makes a great body or face soap does not make a great shaving soap. A lot of people will put some extra glycerin or some sort of natural clay in to a normal soap recipe and call it a shaving soap. While it might well be better than a normal bar of soap and far superior to canned chemical goo, it is a far cry from a fully-fledged shaving soap designed solely for that purpose. The discussion on the forum was tackling that topic head on, with many people going back and refining their long-standing recipes to include points that were made. 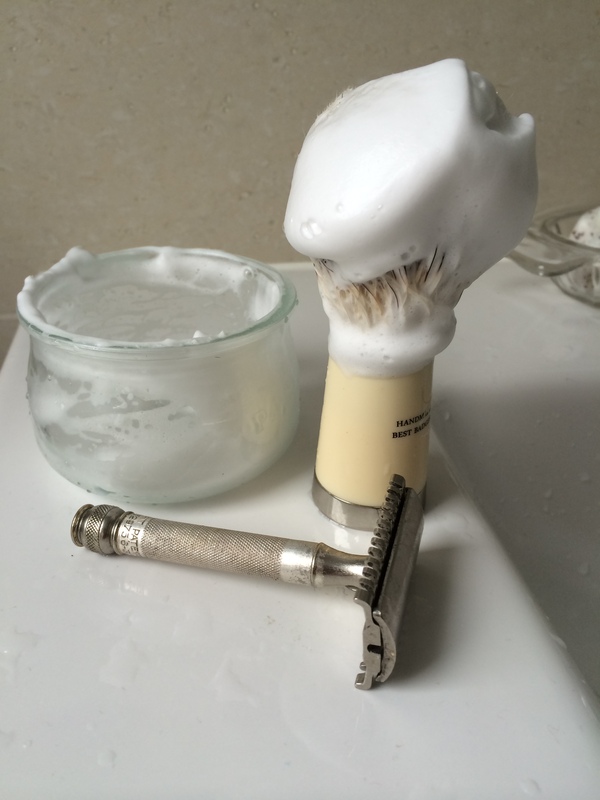 A shaving soap needs to have a lot of lather, but it should be very different from a normal lather. While with a bath soap we generally aim for a fluffy lather with great big bubbles, a shaving lather needs to be dense and stable. A bath soap is designed to clean us while also treating the skin, whereas a shaving soap needs to protect the skin during the shave and provide a cushion allowing the blade to glide rather than being dragged over the skin. Even the type of lye used will be different – many commercially produced shaving soaps use only sodium hydroxide, but many of the artisan use either potassium hydroxide only (produces a softer soap, often referred to as Italian style) or a mix of potassium and sodium hydroxides (produces a harder ‘puck’, often referred to as French stlye). This is because soap made with potassium hydroxide is easier to dissolve in water which allows a shaver to get a much higher ratio of soap-to-water than we usually get with a normal bar of soap. 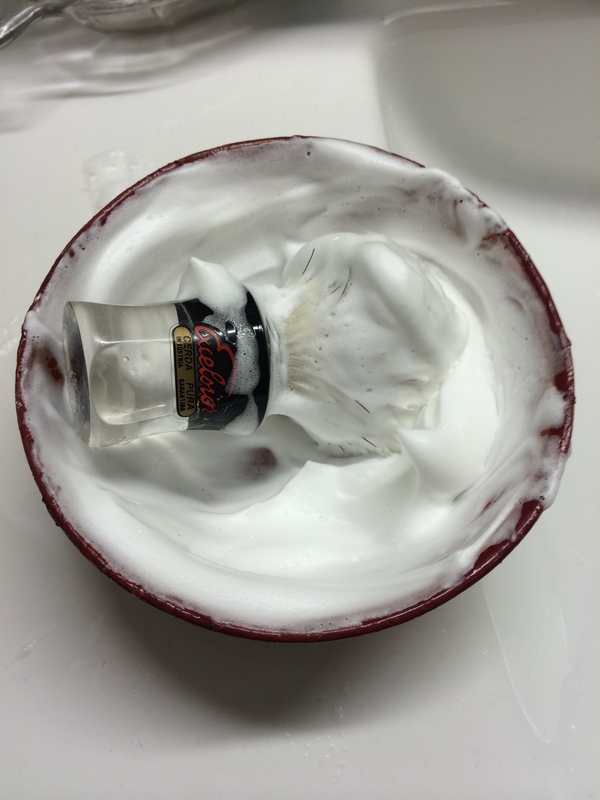 The recipe that was being discussed was one of the best shaving soaps on the market. It is a simple recipe, using only stearic acid, coconut oil, water, potassium hydroxide and extra glycerin (glycerin is naturally produced in the soap making process, but more is often added to a shaving soap). The result is an amazing lather indeed. I decided to change the recipe slightly and replace half of the coconut oil with lard for a creamier lather. I made two variations – one with only potassium hydroxide, the other with a mix of both potassium and sodium hydroxide to compare the two. Because of the amount of stearic acid being used, it is only possible to hot process this recipe, which is not an issue as I tend to use hot process when I can as a default. I also wanted to make smaller batches than usual, so I put the ingredients in to small plastic containers, filled the slow-cooker with hot water and used the heat from the water to cook the soaps in the containers which floated on top. Even with no cure, the results were impressive and it only got better as the soaps matured. To get the best lather, a lot of water is required but once this is mastered, it is a great soap for shaving with. In the futre I will be looking to try out some different combinations of oils to see if this can be improved on or not.